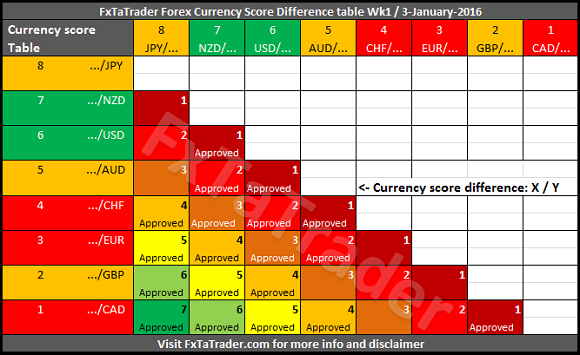 The Currency Score Difference analysis is the more extensive explanation on the Currency score analysis which was published earlier this weekend. Besides these analyses and the corresponding charts I also provide the Forex ranking and rating list. It is recommended to read the page Currency score explained and Models in practice for a better understanding of the article. This article will provide my analysis on the 8 major currencies based on the technical analysis charts using the MACD and Ichimoku indicator on 4 time frames: the monthly, weekly, daily and 4 hours. The result of the technical analysis is the 2 screenshots in this article showing the Currency Score Difference and the Top Forex pairs table. The JPY has a score at the moment of a strong currency and it seems best for trading going long against the weak currencies. The GBP has a score at the moment of a weak currency and it seems best for trading going short against the strong currencies. There is a pullback for the USD and the CHF. The other currencies, the NZD, AUD, EUR and the CAD are within their range. All the interesting pairs from the "Ranking and Rating list" do also look interesting according to the "Currency Score" analysis from the previous article. When looking at the Currency Score Table here below for this week we can see the currency score differences. The interesting pairs should have by preference a score difference of 4 or higher when they are similarly classified. Or the better classified pair should have a higher score than the counterpart. All the pairs mentioned above comply for trading in the coming week. The Currencies are colored Green, Orange and Red resp. by the classification they have. This way it is easier to see what currencies should have a certain score difference. The technical analysis is the most important issue to consider before taking positions, the Weekly Chart is analyzed. I prefer the Bollinger Band for defining where a pair is in the chart. Once a pair is outside a Bollinger Band it is in a strong trend which can cause a strong pullback. Although this may be a good opportunity I avoid taking positions because of the possible unexpected strong pullback. Positions are only opened inside the Bollinger Band and this may be at the start of a possible trend or on a good pullback in an existing trend. The following table shows the location related to the Bollinger Bands of each interesting pair analyzed and approved in all the previous analyses. The pairs located within the Bollinger Bands and at the Bollinger Bands have the best opportunities because the chance of a pullback is the lowest. Any pair slightly above or below the Bollinger Bands may be inside when trading starts again. These pairs have to be checked on opening of the market. Also, any pair outside the Bollinger Bands may be interesting when trading starts because of a pullback in the pair. When trading according to the FxTaTrader Strategy some rules are in place. For more information see the page on my blog FxTaTrader Strategy. Depending on the opportunities that may come up the decision to trade a currency may become more obvious at that moment. If you would like to use this article then mention the source by providing the URL FxTaTrader.com or the direct link to this article. Good luck in the coming week.